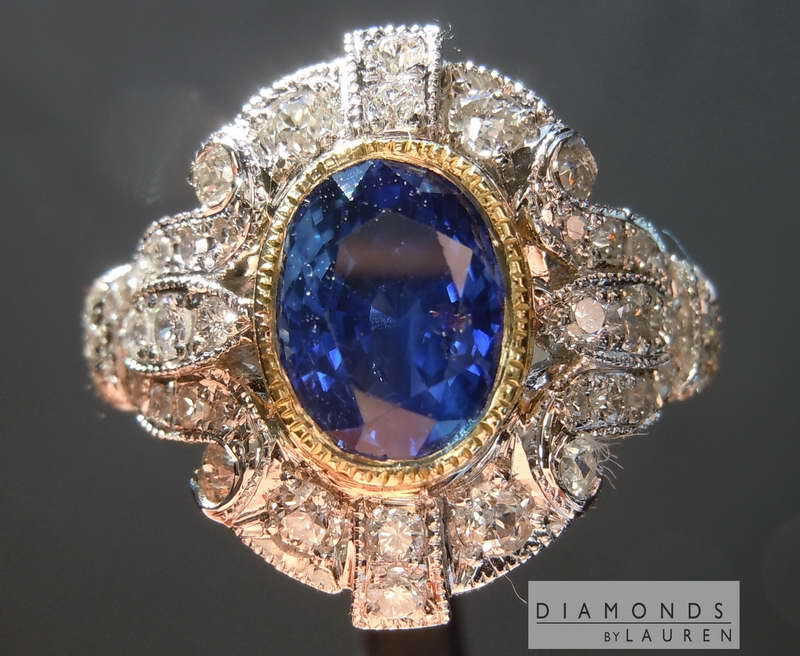 OMG- this ring is purrrrrfect for this Sapphire! We really went to town on the pavé diamonds. The larger ones are Old European Cut. These stones are totally colorless and clean. Tiny tables and a total antique vibe. 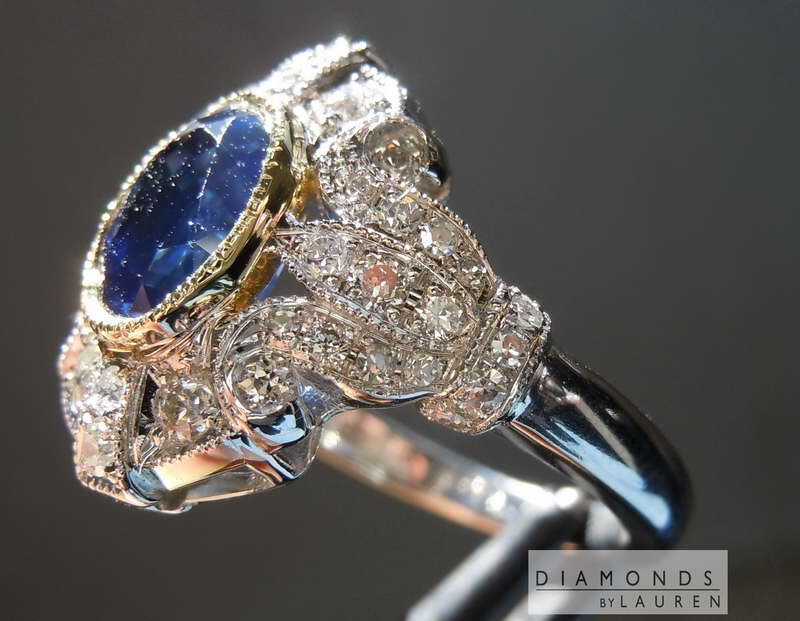 The single cuts are the smallest stones - they go together perfectly. At this point- the color banding is not visible at all. 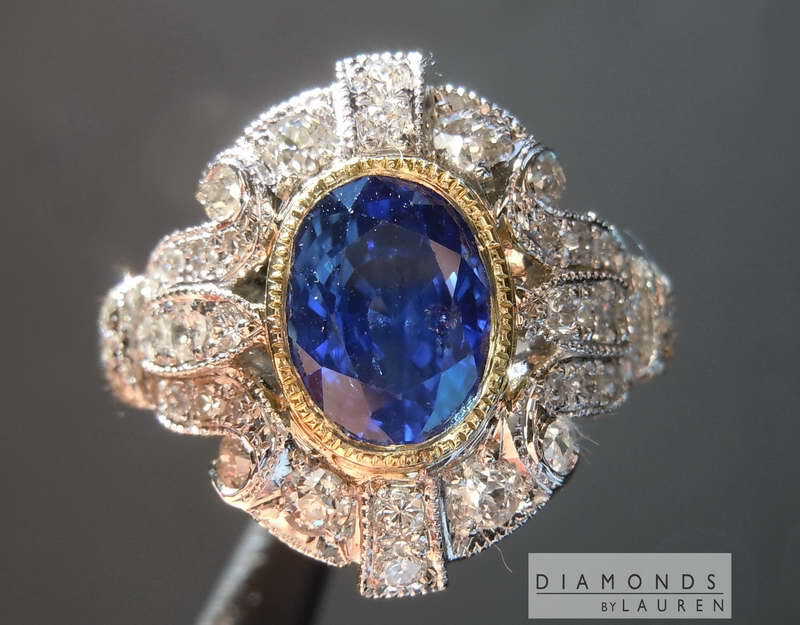 It really looks like a Ceylon color in this ring. 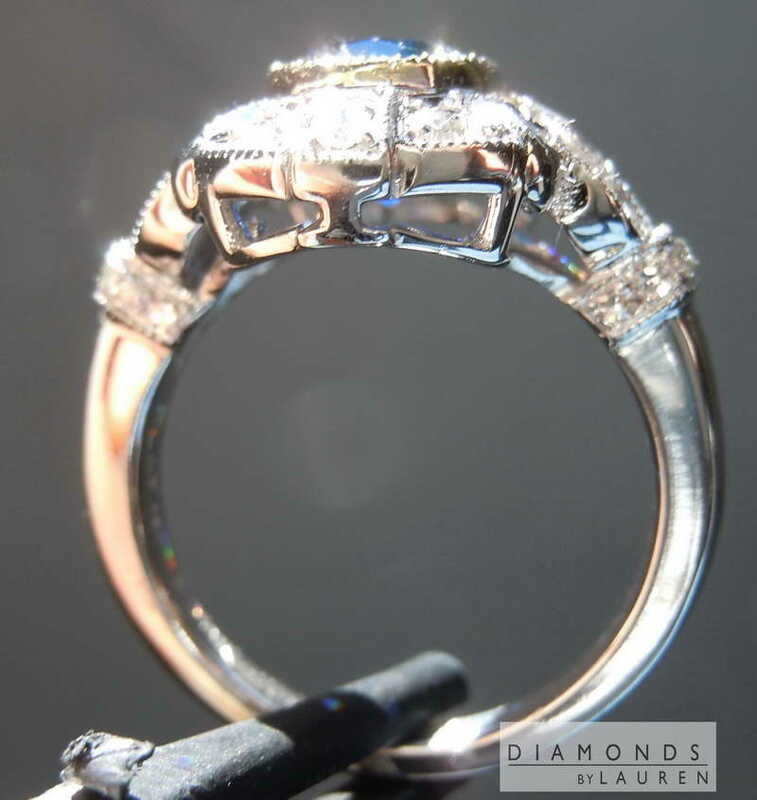 Our custom made platinum ring is quite weighty. 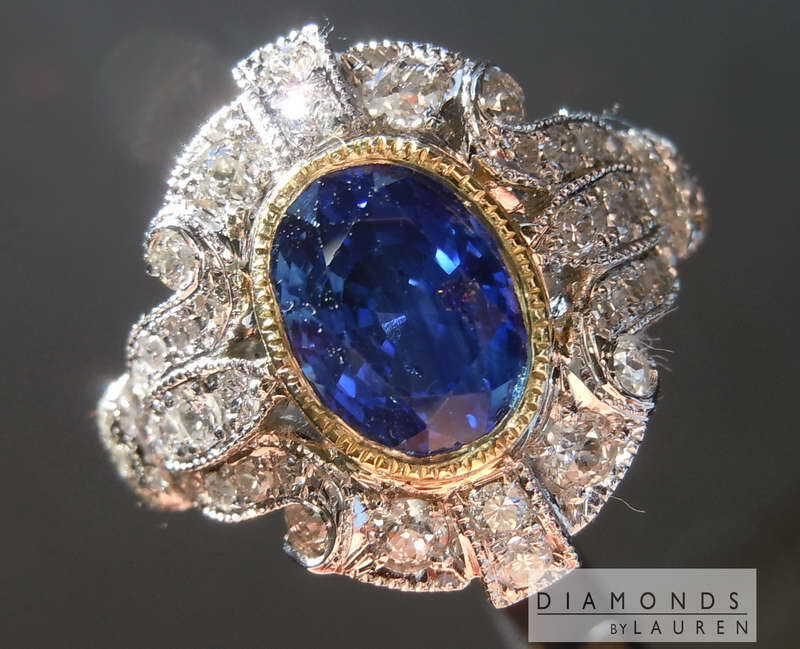 There's an 18kt yellow gold bezel for the sapphire. It's a great look. 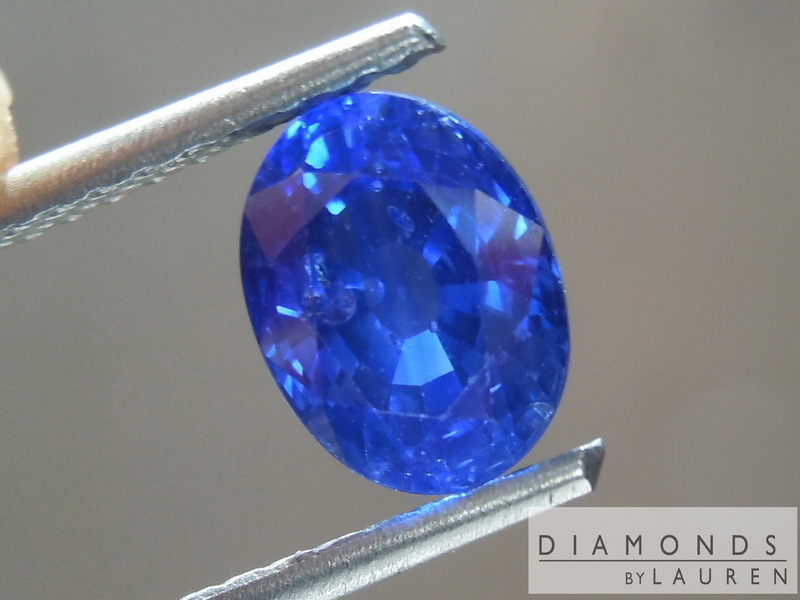 Here is a sapphire with a drop dead gorgeous color. 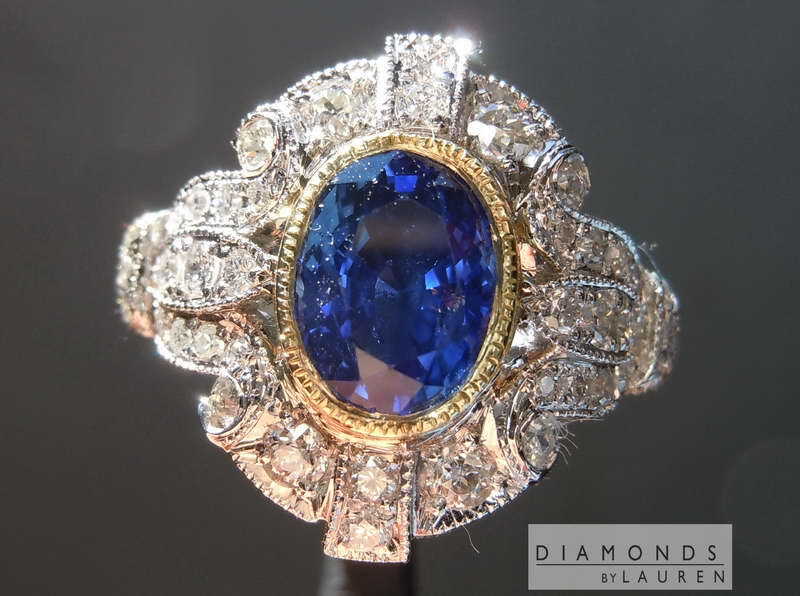 Let's face it, with sapphires, the color is everything. 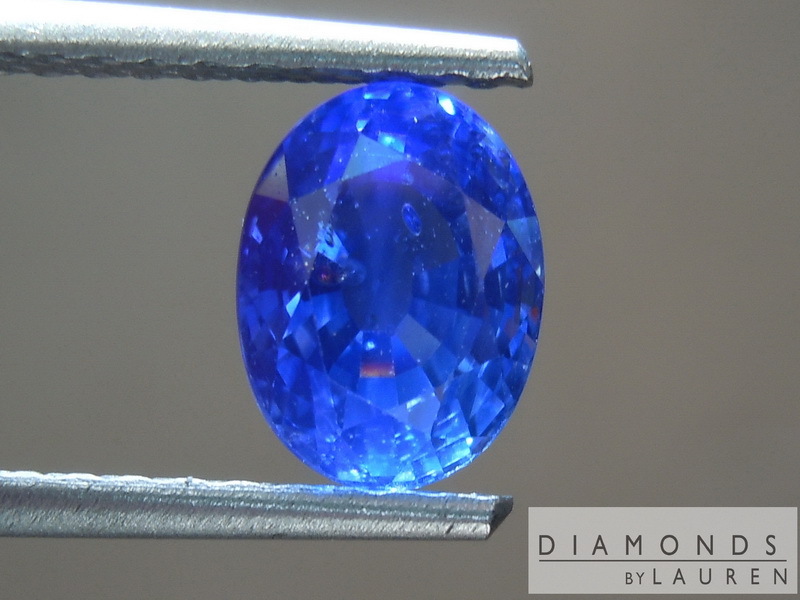 This stone has the color of a stone costing three times as much. 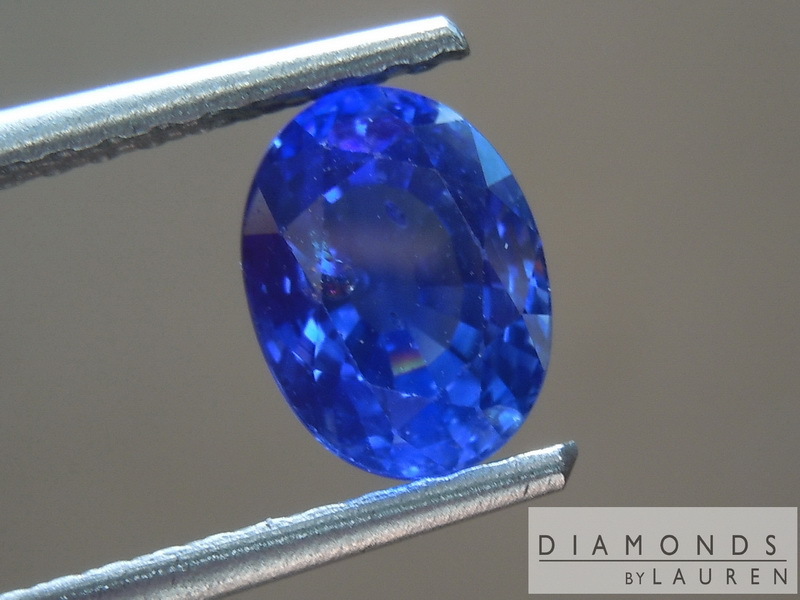 It is a rich blue, just deep enough and not at all purple. Pure bright blue. I love the way the stone is cut as well. Nicely modeled oval with a small table and nice crown. 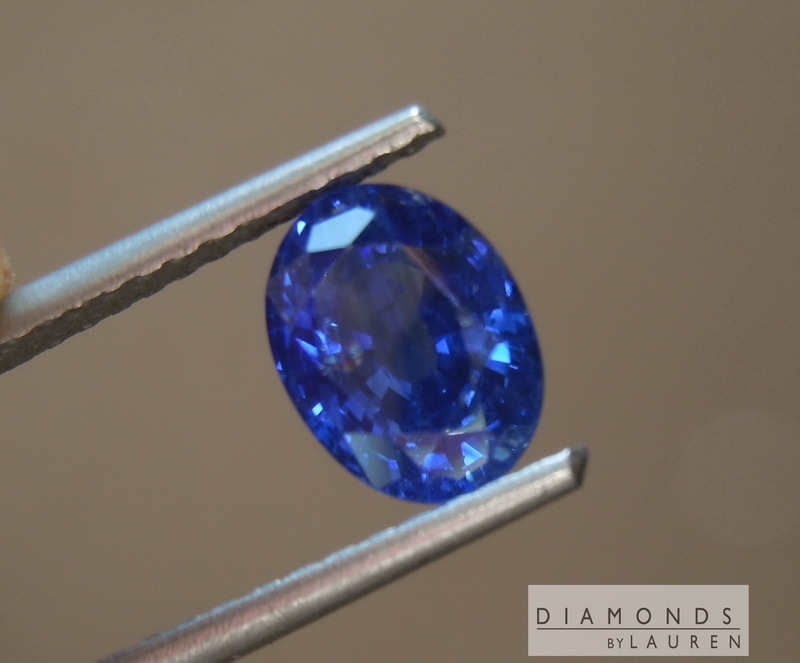 So why is it is a lot less costly than other 2 1/2ct sapphires on the market? 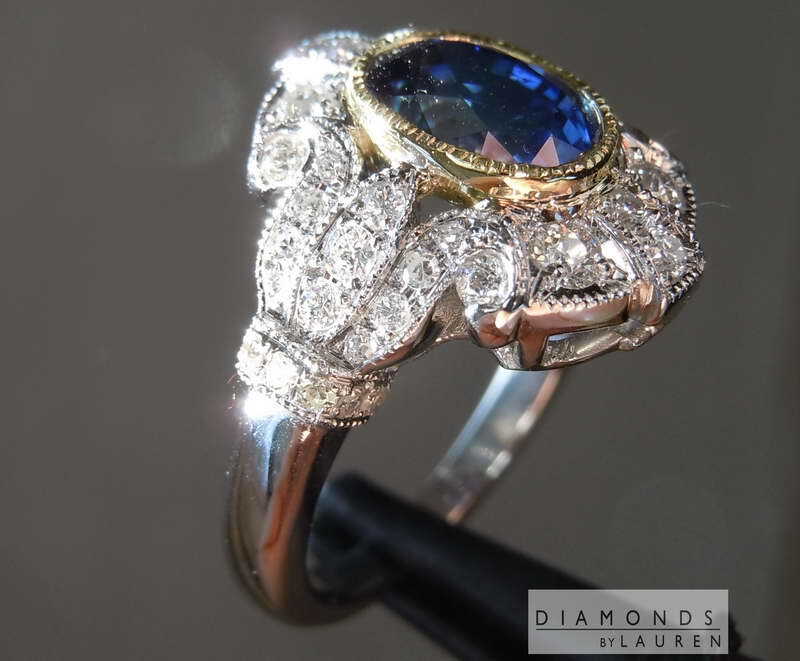 The reason is that the stone is the equivalent to an I1 in diamonds. The stone has a clarity characteristic in the table - you can see it in the pics - and it is possible to make it out in certain lighting. Personally, I don't find it to be a bother. 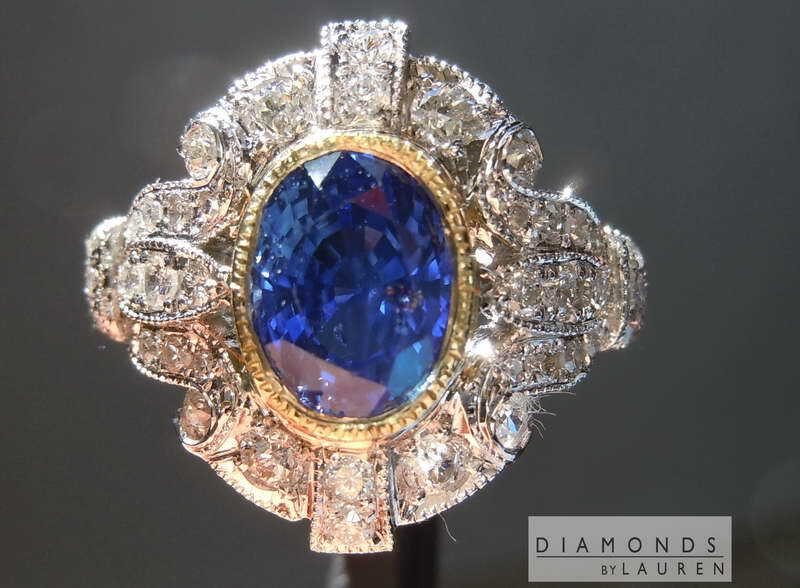 To me it's the brilliance and color that draw me in... the stone is charming.